The full moon glowing over a city at night can make for a very striking image, but you don’t need to limit yourself to a single moon. You can shoot and create a lunar timestack like this with nothing more than your DSLR, a mid-range telephoto zoom, a tripod, and image-editing software like Photoshop. 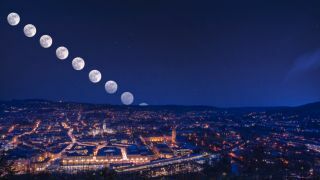 The method is simple: take several photos of the moon as it moves through the sky, and then use Photoshop to composite them into one image. Because the moon will be much brighter than the landscape, you will also need to take an additional photo to expose for the landscape rather than the moon; this will provide your final image with a correctly-exposed backdrop. The challenge with creating a moonstack is working out how much time to leave between photos. You need to ensure that there’s plenty of space between successive moons, but not too much space. If you know where you want to shoot from, it might be worth visiting your location a night or two earlier to take some test shots at different intervals, as we did for our finished image. Once you’ve found your ideal time gap, you will need to keep it consistent throughout the rest of the sequence – this will save time in the editing process. You can do this manually with a stop watch, or you could use a built-in or external intervalometer. You just set the number of shots you need, and the time gap between shots, and then hit your shutter release to begin the sequence. If possible, try to time your shoot for when the moon will be rising or setting soon after dusk (see A Time and a place, below), as it’s easier to get organised and set up when there’s some ambient light to work with. When considering where to shoot your moonstack, try to find somewhere with some foreground detail. Including the local landscape will add interest, and give your final moonstack a sense of place. Depending on your vantage point, and how much of the surrounding landscape you want to include, you may need to experiment with focal length. The longer the lens, the bigger the moon will appear in the sky. You won’t be able to shoot handheld. Each frame in the moonstack needs to be taken from the same direction and angle, so put your camera on a sturdy tripod, and make sure the tripod head is level. You don't have to limit yourself to shooting at night. The moon is sometimes visible during the day, too. Try experimenting with a daytime moonstack. You’ll need to do a bit of research if you want to avoid standing around all night waiting for the moon to appear. Use a website or app like The Photographer's Ephemeris to work out both when the moon will be rising in your location, and – equally critically – where. You also need to work out is when the moon will be full, or nearly full. You can shoot a moonstack of a half moon, but it won’t be as impressive. It’s worth bearing in mind that the moon appears bigger at certain times of the year. Again, The Photographer's Ephemeris can help with this. Mount your camera and wide-angle lens on your tripod and aim it at the moon, but include some environment (whether that’s a landscape or cityscape) in the frame. If you are able to fit the skyline in, try to place it in the bottom third of the frame. Click here to find dates for the next eclipse and start practising. It will go much darker during an eclipse, so you may have to adjust your settings. The moon will move from left to right across the sky, so adjust your composition to position the moon in the left third of the frame, with space to the right for it to travel into in subsequent shots. Also think about whether it will be rising or falling during the sequence. Change your camera’s autofocus setting to single-point (this may be in your camera’s menu, or on an AF switch on the body itself). Alternatively, engage Live View and use the zoom button and multi-selector to fill the screen with the moon, then focus the lens manually. Expose for the moon. It will probably be much brighter than surrounding sky/landscape, so the latter will look almost black (see Step 8 for how to overcome this). If you expose for the sky/landscape, the moon will be over-exposed. We set 1/125 sec at f/11 and ISO200. If you open your shutter for too long the moon will be blurred. There are two movements at play here: the moon orbiting the earth, and the earth itself rotating on its axis. However, a fairly full moon should be bright enough to enable you to set a shutter speed fast enough. Why worry about white balance at all? Stop the moon becoming too yellow or too blue by shooting in black and white! If you’re shooting above a city, your photo will have an orange hue from light pollution. You could aim your camera above the skyline, but then you’ll lose the city. Instead, set white balance (in-camera, or in your editing software) to Tungsten to remove the orange cast. If you don’t want the hassle of merging your photos, another option is to use the multiple exposure feature on your camera to take a double exposure as the moon moves across the night sky. Take some test shots at timed intervals to decide what sort of gap you want between your images of the moon. We went for 30 mins between shots for our moonstack. Once you’ve decided on your interval, keep it consistent between the rest of the images. Now take your shots. Exposing for the moon will almost certainly under-expose the foreground to near-blackness, so take a final shot to expose for the foreground. Extend your shutter speed to around 10 seconds, take a test shot, and adjust the shutter speed as needed for a correct exposure. Open Photoshop, and go to File>Script>Load Files into Stack. Browse to and then select all of your moonstack files, then click on Open. Click on OK. You’ll see all your photos stacked in the Layers palette. Change the top layer’s blending mode to Lighten. Right-click on the layer and pick Copy Layer Style. Go to Select, and click on All Layers. Right-click on any layer and choose Paste Layer Style to blend your layers. Locate the extra shot you took to expose for the scenery, change the blending mode to Normal, then left-click and drag it to the bottom of the Layers palette. All the moons will appear, with the background now visible too. If the moon in the background image is distracting, select that layer, grab your Patch tool, draw around the moon, and move the selection to somewhere non-distracting. Once that’s complete, save your file. Why not combine all the phases of the moon throughout the month? Take a shot of the moon each night and composite them together in Photoshop to demonstrate it waxing and waning, from new to full moon. It will be tricky to do this in cloudier countries (the UK included! ), so some phases may have to be shot in other months.